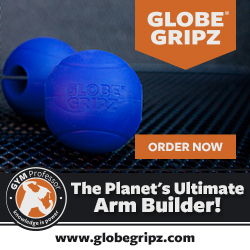 The website for powerlifter and Bodybuilding.com columnist Mark Bell’ invention the Sling Shot is howmuchyabench.net, so it’s clear that it’s meant to appeal to lifters who like to push up some serious weight. It has quickly developed an incredibly loyal following among that community, too. People who own and use the Slingshot have a tendency to talk about it with a misty far-off look in their eyes. Bellâ€™s lifting pedigree is rock-solid as well, so this was definitely something I had to try for myself. Click over to the Sling Shot’s website, and the selling point is clear to see: Bench Press Heavy with No Pain. It also claims to add 10 percent to your bench press. I used to compete in the bench press, but years of heavy pressing took its toll on my shoulders, to the point that I was sure my bench press days were over. So yeah, I was a little skeptical going in. Due to having been away for so long, I chose the Reactive model, which is slightly more flexible and pliable than the Original, and is designed for higher reps. There’s also a heavy-duty Maddog models, which is recommended for weights greater than 350 pounds. The basic construction is consistent in all three. It’s basically a wide strip of tough elastic and canvas, into which you fit your arms up to the elbows before setting up to bench press (or do push-ups and dips). As the bar descends, it stretches the Sling Shot across your chest and then assists you with the press. The higher the bar ascends, the less assistance you receive, until you control the entire weight on the bar just before lockout. I thought this restraining device would feel strange and uncomfortable, but it actually felt natural. This entry was posted in Training Tips and tagged bench press, increase your bench, Jim Vaglica, mark bell, shoulder pain, sling shot. Bookmark the permalink. Was I Prepared for a Reality TV Adventure Race? How Does A SWAT Team Really Train?